The Torment of Sotheby’s: Did a Michelangelo Painting Slip Through their Fingers? I’ve always had a soft spot for Michelangelo. Think of it as a schoolgirl crush which germinated when I fell head over heels in love with David at the age of fourteen or so. No matter that his splendour was somewhat tarnished by the fly-spotted, discoloured slide projected in art history class in high school. Since then, I’ve developed an abiding passion for the art of printmaking. 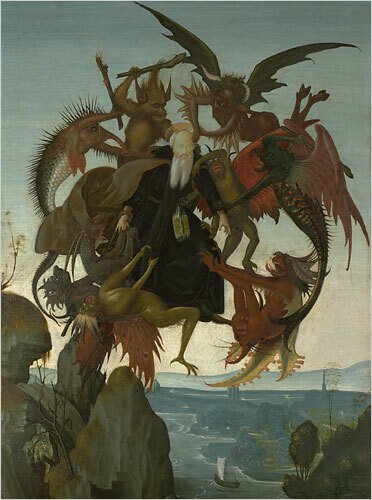 And in the meantime, I’ve been intrigued by images of the Torment of St. Anthony… Martin Schongauer’s is one of my favourites. 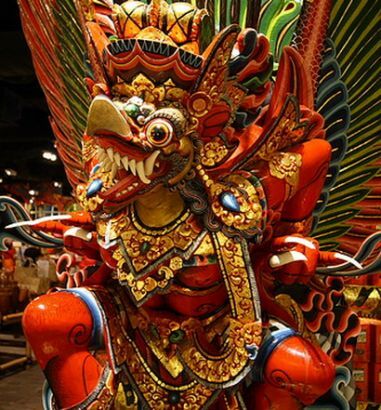 His demons always remind me of the Hindu/Buddhist divinity, Garuda (image right). So, imagine my joy when I discovered that all three things may well be combined in a single image (pictured above). Kimbell Art Gallery in Fort Worth, Texas, picked it up for a song – they believe that it was painted by Michelangelo at the age of 12 or 13 after Schongauer’s print (around 1487 or so). Adam Williams, an art dealer, bought it from Sotheby’s where it was catalogued as ‘Workshop of Domenico Ghirlandaio’ – where Michelangelo served his apprenticeship. It is believed that the Kimbell then bought it for about $6 million. Although the authorship is disputed, it’s a stunning painting. Oh, please let it be true, art-world pixies. I want to believe!